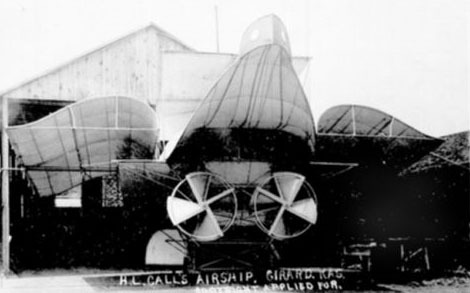 Many experimented with flight in the years immediately following the Wright brothers' triumph and Kansas was not unique in its production of strange looking aircraft. A number of unique planes were built in small towns and if one of these products had been successful Girard, Jetmore, or Goodland might have rivaled Wichita as the "air capital of the world." It has been claimed that Girard's Aerial Navigation Company was the first airplane builder west of the Mississippi. Promoted by Topeka lawyer Henry Call, the company did business from 1908-1912 and built eight or nine planes, of which the first six never flew. The seventh did fly for less than a mile before it cracked up. Its pilot survived, his only injury a black eye. Call used the mailing list of the Appeal to Reason, one of the nation's leading Socialist newspapers, to try to sell stock in his capitalist venture. He lost $85,000 before he filed bankruptcy at the end of 1912.